Gorillaz won't be covered on "Glee." 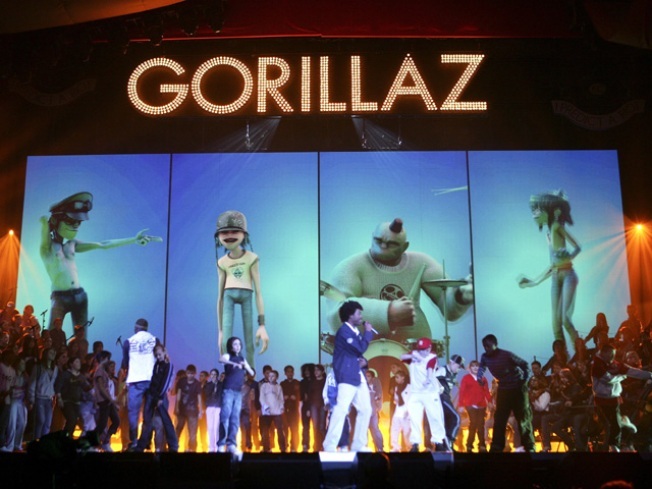 The virtual band Gorillaz isn't exactly going bananas over the television musical series "Glee." Lead singer Damon Albarn says he's not interested in letting the hit show perform covers of his band's songs. "We wouldn't let that happen," Albarn said in an interview with The Associated Press last week. "And not that they've asked us because they haven't, and now they definitely won't," he continued with a laugh. Gorillaz is best known for their Grammy-winning jam "Feel Good Inc.," which features De La Soul. The group released two platinum-selling albums, and their latest, "Plastic Beach," came out in March. "Glee," the Fox television musical series about a high school glee club, recently premiered its second season. The show features cover songs from a slew of top artists, including episodes based on performers like Madonna and Britney Spears. The series counts Beatles legend Paul McCartney among its fans. He asked "Glee" co-creator Ryan Murphy to consider using some of his tunes on the show. But Albarn says shows like "Glee" showcase "a very poor substitute for the real thing." The "Glee" cast recently surpassed the Beatles for the most appearances on the Billboard Hot 100 chart by a non-solo act, but Albarn says people shouldn't take the feat seriously. "Those songs won't last like the Beatles by any stretch of their imagination," he says. "They'll be forgotten in a few years' time." Gorillaz kicked off the North American leg of their "Escape to Plastic Beach World Tour" earlier this month. It wraps up in Vancouver on Nov. 3. PLAY IT NOW: How Did Dot-Marie Jones Land The Role Of 'Glee's' Coach Beiste?